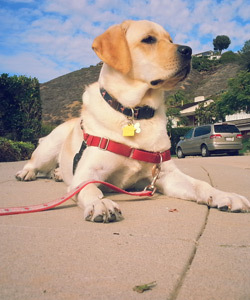 Dog walking is a necessary and valuable part of an urban dog's daily routine. At Doggie Joggie, our goal is to make each dog walk as positive and productive as possible, because we know that the benefits of dog walking extend far beyond a simple potty break. Our dog walks emphasize physical exercise, mental stimulation, cultivating confidence and instilling a sense of purpose in the dogs we work with. You might not be surprised that dogs who are left alone will spend 80% of their time resting and conserving energy, even if they have access to a yard. So when you come home at the end of the day, you become the outlet for all that pent-up energy. This means that while yard access is a wonderful option for potty breaks and fresh air, a yard is not a substitute for the exercise and mental stimulation of a walk with an experienced dog walker. Physical exercise is extremely important for dogs to remain in optimum health. The cardiovascular, musculoskeletal, and endocrine systems, just to name a few, depend on regular, daily exercise. Dog walking is a simple but effective way to help our dogs live long, healthy lives. Proper mental stimulation for dogs can often be more exhausting than physical exercise alone. Have you ever felt really energized after a good workout? Well, dogs are the same. They need a lot of exercise alone to get worn out. Some dogs can run for hours, but after 10 or 15 minutes of focused concentration or obedience training, they will be ready to pass out. So our dog walkers like to incorporate mental stimulation as much as possible into our dog walking routine. This is achieved through obedience breaks, dynamic directional shifts, verbal and non-verbal direction, and lots of positive reinforcement to reward focus and concentration. These techniques require our furry clients of focus on us rather than spacing out in the sniff zone for the entire dog walk. It helps us maintain loose-leash manners and helps our dogs stay engaged. Our goal is for these walks to be as positive and productive as possible. Dogs feel a sense of duty, purpose, and accomplishment when they patrol their neighborhood. A dog walk satisfies their need to feel like they are making a contribution. And exposure to the sights and smells of their neighborhood give them a sense of what is going on beyond their front yard. Each dog walker at Doggie Joggie is an experienced pack leader, and we can't help but bond with the dogs we walk. Taking cues from, and practicing discipline with a trusted pack leader provides confidence and feeling of security within a pack hierarchy. Q: What kind of walk does my dog need? A: Everyone at Doggie Joggie is an experienced dog handler, sensitive to the needs of each client. Your dog walker will come to your house for free to meet you and give your dog a free walk. Most of the time, a backup dog walker will accompany the dog walker to meet you. This way, in case of emergency or time off, your backup dog walker will already be familiar with your dogs needs. We consider your input, along with each dog's size, age, temperament, socialization, knowledge of commands, medical history, energy level, and a variety of other factors to customize our dog walks to fit the needs and abilities of each dog we work with. Q: Will you walk my dog the way I think they should be walked? A: Of course. We love it when doggie parents take an proactive role, informing us of their dogs needs and what works for them. We are happy to reinforce any work you've done with your dog. We are also happy to dialogue about any skills you'd like your dog to improve, and discuss how to achieve those goals. Q: Who will be walking my dog? A: Ideally, your primary dog walker (and their backup) live in your neighborhood. You will meet them at your free meet-and-greet at your house. At Doggie Joggie, we have a very strict policy that you and your dog always know anyone entering your house and handling your dog. We can usually accommodate specific requests regarding the gender of your dog-walker. Q: How do I know that my dog has been walked? A: After every walk, your dog walker will send you a photo report. We keep an eye on weather, water intake, energy level, and poo and we will keep you updated with cute photos of your dog's adventure that day. With your permission, we often post these photos on our Doggie Joggie instagram page. A: Many of our doggie clients have dog aggression, barrier frustration, socialization issues, or leash reactivity, or are just divas. So our general practice is to avoid strangers (4 legs or 2) when we're out on our walks, and always stay on-leash. A: Yes, Yes, and Yes! Before our free initial consultation, we will be happy to provide proof of this information. We advise you to always ask pet care providers for proof of bonding and insurance before allowing them to care for your pet. Reputable providers will be happy to oblige. Q: My dog can be aggressive toward some people. Will you walk my dog anyway? A: Each dog is different. Most of our dog walkers are not licensed dog trainers, but we do believe that dogs can be rehabilitated through proper training and reinforcement. We don't believe in "bad dogs". Depending on the details and severity of the aggression, we might refer you to a licensed dog trainer to evaluate the situation and prepare a training plan to help your dog trust. We will safely reinforce any routine that will help your dog be the happiest, most trusting version of herself. Q: My dog gets along great with everyone, do you have an entourage of other dogs to walk with them? A: If we know of a good potential pack-mate, we will happily supervise an introduction on "neutral" territory. You are welcome to come too if you're available. Good potential pack-mates could include other clients or our own family dogs. We believe in the overwhelming value of socialization in packs. We have even introduced some pack-mates that have became best friends. A: Safety is our top priority, so in general, we like to stay on-leash. But on a case-by-case basis, and only when everyone is comfy and trusts each other, we love practicing (legal) off-leash walking or socialization at dog parks. We will even bring your dog's balls. Er.. toys.